Living situation: Own a house and pay $2,000/month in mortgage. My only debt right now is mortgage debt, across three homes (primary, vacation, investment property), totaling $830K. I have pretty good mortgage rates (3.5%, 3.75%, and 4.5%, all 30-year fixed), so I am paying the regular monthly payments. While I made an extra lump sum payment on my primary home with a bonus a few years ago, I now just put those bonuses into savings/investments so that I could pay the mortgages off later if I needed to. I paid off my student loans extremely aggressively — all were paid off within two years of graduating. Although I had a job that paid well right out of college (I started at $60K), I tried to live frugally where reasonably possible in order to prioritize paying these off. I am very uncomfortable having debt, so it was important to me to not have my student loans hanging over my head. I max out my 401K ($2,100/month). I used to max out my Roth IRA before I became ineligible for that. I still do a “backdoor Roth” where I put it into a traditional IRA and then immediately convert it, so that the earnings will be tax free. I max out my HSA at $260/month… I figure even if it stays in there now without me using it, it will be good to have when I’m older and more prone to health issues. I have had two health issues that depleted my HSA significantly, over 10 years, so I figure it’s a great emergency fund — especially since I’m on a high-deductible plan. I also save $4,500/month post tax in a combo of index funds and a managed portfolio. I prefer to manually transfer the funds when my paycheck comes in, which forces me to check out my financial situation every two weeks and see how I’m doing. I transfer the money from my paycheck bank account to another “transaction” bank account, then I have automatic transfers for my investments set up to take the money a week after my paycheck hits. I feel like that’s the best of both worlds — keeps it simple but also forces me to continuously evaluate and reassess. And if I’m short on funds, I could always stop a transfer. I started using a financial adviser last year, who manages a portfolio for me that complies with my company’s guidelines around what I can/can’t invest in. 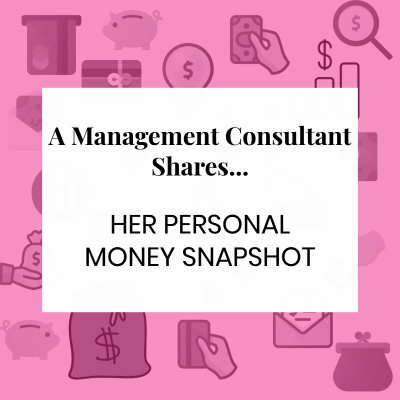 (Working in consulting, there are a lot of restrictions around investing in clients.) I felt pressured to start using an adviser by my company, but I do wonder if it’s worth the fees (1%) or if I’d be better off with it all in index funds. I put $2,000/month into that portfolio for my adviser to invest as he sees fit, and then I put $2,500/month into the Schwab Total Market Stock Index fund. I feel very uninformed/inexperienced when it comes to investing, but I haven’t prioritized learning about it. $20? Ha. I don’t keep actual physical cash. $8,000 — currently very depleted from the down payment on my vacation home. I would like this to be $20K. This is my emergency fund, and I keep it in a savings account. Entertainment: $30/month for a local concert series I like. I rarely buy books (yay for libraries!) or go to the movies. Health care — premiums and other costs: $80/month for a high deductible plan ($3,500 deductible). I probably spend about $500/year from my FSA for various things (medicine, co-pays, contact lenses). Vacations – Average: Low — I tend to take a lot of three-day weekends, using hotel points and frequent flyer miles, so they still often fit in my regular weekly budget of ~$400/week. Charity – Average Donation: $20 to any friend asking for money for their pet charities, and then I go to a decent number of events ($150 for a ticket, another $100–$500 on auction items/general donation). Individual items of clothing – Average: I have inexpensive taste — I really like Old Navy for trendy stuff because I don’t care if it lasts that long anyway, and for classic pieces that I do want to last, I tend to buy from Banana Republic and Lands’ End. I like shopping brands online that I can easily return in stores rather than having to mail them back, and I tend to buy a LOT to try at home, and then return a lot. I almost always wait till things are on sale to buy, and will often put things into my cart that I like, then come back to it weeks later when I see they’re doing 50% off everything (or whatever). I’d say I typically pay around $30–$50 for a work dress, $10–$20 for a shirt / sweater, $20 for jeans, and $20 for shoes. For black-tie events, I’ll find gowns for $80–$150; there are a lot in this price range from basic department stores (e.g., Macy’s). I like seeing the pieces featured on Corporette, but most of them are much more expensive than what I’d consider buying. Car or other vehicle – Last purchase / current main vehicle: Bought a new SUV for $25K that is five years old and that I plan to drive several more years. I could save $1,000 a month if I got a roommate for my gigantic house that I live in alone, but I don’t because I really value having my own place. I love my neighborhood, but it doesn’t have any 2-bedroom houses, which would have more than sufficed! I did look at a few townhomes that would have been a great size, but the value wasn’t nearly as high compared to paying just a little bit more for twice the room. $25K. In hindsight, I wish I had bought a used car rather than new. (1) I bought a townhouse five years ago for $130K; it’s now worth $180K. I rent this out for $1,500/month, which more than covers the $1,000/month mortgage. (2) Last year, I bought a vacation home for $525K; the mortgage is $2,400/month. I partially rent it out for $2,000/month, which allows me to still enjoy it part time without having to pay the full burden of the mortgage. I eventually plan to stop renting it out. When I graduated college, I went home and lived with my parents for three months until moving to start my first job. I worked at a restaurant to cover spending money, but they paid my cell phone bill and I didn’t pay rent/utilities. I’ve made loans to a few family members of $5K–$20K; some have been paid back and some haven’t. I don’t like loaning money to people so I only make loans that I am comfortable losing entirely. I keep a spreadsheet of all my accounts, and a general budget, though the only categories I “budget” for out of my paycheck are mortgage, utilities, internet, savings, and the rest in a generic “spending money” category. I don’t budget separately for food because I could easily make dinner for $5 from the grocery store or buy a meal for $150 at a restaurant, so I think of food as a form of entertainment and want it included in that generic “spending money” category. I budget $1,500 month for “spending money,” and when I pay my credit card bill (which I do in full each month), I see how it compares to that budget. If it’s over, I keep it in mind and try to tighten my belt a little bit the next month. But I like the freedom of not having to worry about individual purchases, and just looking at it in aggregate. I’ve used this strategy since I graduated college, though back then my budget was $800/month ($200/week). I think the spirit of these financial open doors is to be informative, helpful and a bit of “you go girl” but that’s not possible without being honest. Is there a significant other, parental help, or inheritance that wasn’t included? It’s kind of disingenuous, especially to young women at a similar income level or similar path to that income level, who look at these sort of postings for recommendations or inspirations. I agree – something doesn’t add up – when I read her savings number, I was blown away. I make about the same amount, and even trimming back to her level would only be able to save about $3500/month, and I’m pretty pleased that I manage a house in a VHCOL area alone and still save $2000/month! I thought the same thing, at first, but the investment savings are listed twice — once when she says she saves $4500 per month, and then in the following paragraph it’s split into $2000 and $2500. In CA, her take-home pay is roughly $10,000/month after state and federal taxes. $1900 mortgage (after subtracting rental income payments, though not sure how taxes on those work), $2100 401k, $4500 savings, $260 HSA, leaves approximately $1500/month for spending on everything else, as she describes. Agreed, some things are duplicated throughout the article. The numbers work out fine. Mortgage is $2k after the tenants’ contribution, 401(k) is $2k pre-tax, other savings is $4,500/month, that’s under $9k/month. After tax income of someone making ~$200k is probably around $11k/month. She says she’s spending ~$1,500/month so the math checks out to me…spending + savings roughly equal take home pay. I think the real key here is that her expenses are so low – I live in a LCOL area and it’s a struggle to keep my monthly credit card bill around $3000 (I pay it in full each month, and pretty much everything except mortgage and childcare goes on the card). I can’t imagine keeping it to $1,500 in a HCOL city, but if you read her budget break down it makes sense – she spends on groceries in a month what I do in a week. I think that’s because of her work travel. I used to work in consulting and the M-Th travel (sometimes F too) saves you so much money in terms of groceries! It also funds most personal/fun travel due to all the points and miles. I found that for me, it also helped me save a lot of money because I was not home to spend money spontaneously. One day of rest/recuperation at home (basically free) and one brunch with friends or a spin class or whatever per weekend do not add up to be that expensive even in a HCOL area. My BF worked in consulting too. In addition to salary, and bonuses, when he was staffed on an out of town project, he would make at least $50/day in per diem and a great deal of his food and entertainment was picked up by the company. Working late? Company pays for dinner. Early morning meetings? Partner is bringing in coffee and pastries. Client meeting? Lunch is brought in. He could basically bank his per diems and a good portion of his pay because he never had time to spend it! Although my expenses are covered when I’m traveling, we do not have a per diem policy at my company, where you get to pocket whatever you don’t spend; we simply get reimbursed for what we eat. So, no extra money is coming in that way. Also, I’ve worked locally for some projects (longest was about a year), and I found that my spending only went up about $50/week if I was local vs traveling. It is REALLY inexpensive to cook at home vs going out, and I don’t mean crazy frugal recipes like rice/beans. I typically grocery shop every week for what’s on sale, and restock my pantry based on that – then cook based on whatever I have on hand. I always have a TON of food on hand, so it’s never felt limiting in the slightest, and of course if I’m craving some dish with an ingredient that I don’t have and that isn’t on sale, I’ll still buy it. I usually try to host friends at home for dinner rather than going to a restaurant, and I find that I can usually host a few people for less than it costs me to buy a meal / drinks at a restaurant for myself. One of the biggest differences I see between my lifestyle and my friends’ is that I almost never order takeout; I’m either out to dinner for the experience, or I’m cooking at home. I also did some rough math and I ended up with her spending about $10k a month between rent, investments and her listed expenses (before tax income being $15k monthly, $2100 of which goes to tax-advantaged savings) — she said she rents out one home for $1500 which covers the $1000 mortgage and the vacation home for $2000 a month which covers most of the $2400 mortgage, so she comes out $100 a head on properties. It seems about-right-ish, especially once you factor in bonus? I mean, I’m a fed and don’t make anywhere near this kind of money and have a negative net worth, but I see how it could happen. I think the discrepancy is in the net worth. Given what she has in savings and equity, versus the mortgage balances, unless her properties have dramatically appreciated, that number is a bit high. The others seem to work as long as you remove the duplicates. Property appreciation accounts for ~$230K in aggregate. I hope that’s helpful, and I apologize for duplication in my responses. It’s not your fault – I filled out the snapshot too and there was a lot of repetition and similar but not quite exact questions, so I think the survey and the answers just need a little better editing. Thanks for sharing! I would encourage you to have an estate plan in place, even if the intestacy provisions are ones you are comfortable with. An estate plan also has a health care proxy, power of attorney, pour-over trusts that can bypass probate, and they name an executor/personal representative. It really will be harder on people left behind if those documents aren’t in place. Thank you – I will look into this! I don’t think you live in a HCOL area if you bought a large single family house for $470k. That’s pretty much the going rate for a nice house in my small Midwestern city, which I would describe as a LCOL area. My friends in the Bay Area/LA/Seattle are buying townhouses in the $1.5-2M range. It depends if you divide between VHCOL/HCOL. You are listing the very top markets in the country. But that doesn’t mean that North Jersey or DC suburbs aren’t HCOL even though they don’t stack up to SF. Where would you buy a large single family home in north jersey under 500k? Maybe Sussex County? But then you have to live in Sussex County, where there’s not much to do and a long commute to everything. Sussex county native and this made me laugh. I wouldn’t say there isn’t much to do, but there isn’t a lot of variety. If you live close to Route 80, you can be in Morristown in 35 minutes. Some great restaurants in Sparta. Just be thankful you didn’t have to grow up there 25 years ago. She said she bought a townhouse for $130k. I live in the DC area, and there is nowhere that you can find a townhouse for that amount of money. Nor could you find that in Chicago or any other HCOL city I know of. Houses for $470k and townhouses for $130k sound like standard cost of living, not high. You couldn’t find a townhouse that cheap even where I live, in the middle of nowhere. Yeah I agree that the places I mentioned are VHCOL, not HCOL (especially the Bay Area). But I don’t think you can get a single family house for under $500k in DC or Chicago or the NYC metro area or any other area that most people think of as expensive. The numbers she threw out are really pretty affordable for housing. I also live in the DC suburb area (MD side). I have about a 10 min walk to the metro. My first property purchase was a SFH in a D.C. suburb that I purchased in 2014 for $250,000 and that I now rent out. My second property purchase was late last year for a 3-bedroom townhouse for $410,000. I think when people think of DMV being really high cost their minds automatically go to the richer suburbs, but there are other choices. I don’t have kids so I’m not worried about school districts. That really opens up options. Ok but then your suburb isn’t really a HCOL area, is it? DC may be a HCOL city, but that doesn’t mean every surrounding suburb is. If you can get a house for $250k, then I think you live in a pretty average-to-low cost of living area. Thank you for stating the obvious. The comments above said that it’s impossible to find a house in the OP’s price range in the D.C. area. I was providing a counterpoint as I live in the D.C. area. Idk where the OP lives but it’s possible she was just generally referencing an area that is nationally considered to be relatively HCOL, but even within those regions there are options. I had the same reaction. Impressed with her finance, savings ability and frugality, but $470K house does not convey “HCOL” to me (though I live in NYC, so may be skewed). Even in the burbs, $470K is not going to get you much, let alone the large house she describes. Car insurance would be higher as well. This. Unless it needed a lot of work 470K seems very low for a single family home in a HCOL area. By comparison – in DC the median single family home cost is 730K and even in Denver (which isn’t exactly HCOL) it’s over 500K. My guess is that the OP moved from a truly LCOL area (like KC, wherein you can get a decent house for $150k) to a place like Charlotte or Austin. The latter feel expensive when houses cost twice as much, but no one’s talking about 3-bedroom houses for $750k to a million. My apologies for being at all misleading. My city is a HCOL city (not VHCOL), where townhouse/condo prices downtown are minimum $1M, but I’m not sure how my suburb would be classified as far as COL. My house is worth significantly more today (~$650K) than when I bought it ($470K). And, my townhouse and vacation home are both in totally different places than my primary home, and are not HCOL. Hope this helps clarify! I’m guessing you live in an La suburb (like the valley), where there are plenty of houses for less than 1 mil. Even the outer bay areas have some mid cost living, but def have to go further out. Can’t wait for haters to chime in saying this isn’t real because they think big law is the only key to success and money. You go girl! I’m impressed. Lol nobody here says that. If anything, there have been lots of lawyers here pointing out that finance and other fields can be way more lucrative without the expensive training. Sorry you’re wrong. Look at the first comments. Doubts from the start. Been reading here daily since 2008 and saw those first comments coming a mile away. I was responding to the “because they think big law is the only key to success and money” part of that post. Nobody here thinks Big Law is the only or even the fastest path to big bucks.
? Someone not getting the math at first because items are noted twice a couple times is not the same thing as assuming that big law is the only financial success path in life. Haha sure if your reading comprehension is awful, then they said that. Agreed. No one here would ever question how much someone else made, more whether or not the numbers stack up to take home. In fact, it’s well known that big law is pretty much a rat race with a slightly higher than average salary for most. Uh she’s in finance. I’m pretty sure everyone acknowledges that biglaw, finance AND medicine are paths to money, not just biglaw. Impressive! Do people really sit here to add up the numbers on others’ finances to see if it’s plausible or not? Give me a break. I’m going to trust it’s for real — whether every line item adds up or not — because it IS possible to get to these levels at this age. You go, girl. I was you 5 years ago, except the “vacation home” didn’t happen until a year ago and said vacation home will become my parents’ primary residence when renovations are done this summer. So rental income will not be a thing until they pass. Given the OP’s finance-challenged parents, I would like to know if she has plans to help them and how. Paying for nursing care and other support is insanely expensive – for example, a 24/7 home nurse would cost more than my monthly salary even at a low $15/hour. I feel so fortunate that my “parent support” can be providing a tax-advantaged investment vehicle for them to live in. Ironically, if I hadn’t prioritized savings as much, I would have “only” been able to write checks every month – no tax savings, no potential appreciation gains, etc. I am hopeful that I will not need to write checks on top of providing a home; this depends on their pension funds remaining solvent and their moderate savings stretching out a while. As a side note, if you are dating I encourage you not to share info re: your 2nd and 3rd properties with your prospective suitors. I date across the income spectrum and the reaction is always negative (or positive at first, but them they slowly expect me to finance their bucket list experiences, support them rent-free in my home, etc.). Agree with this. No reason for a casual boyfriend needs to know your NW, your investments etc. You can’t be too trusting of people’s motives. Thanks for the dating tip! It usually comes out at some point, especially since I visit my vacation home often, but I may try to keep it closer to the vest going forward. Caring for my parents is one of my biggest financial worries… I have no idea how I will do that :( One parent has a decent health benefits package from retirement, but the other does not (and is not yet retired). I’m also 33 and it always boggles my mind to see people my age with so much money. But I’ve never had a five figure bonus or made six figures. Yeah, that’s the difference. Don’t beat yourself up. If it makes you feel better, I’m 33, was in Big Law for 4 years and still have a well-paying low six figure job, and although I feel very comfortable financially and believe I’m saving responsibly for my future, I don’t have a million dollar net worth or three houses. Kudos to OP, but this is not the norm, even for people at her income level. +1 I was in biglaw for 6 years, and have a low six figure job, and spend less spending money (but more on housing) than the OP, and I’m still no where near a million dollar net work. But I like seeing the numbers for a single woman, and think that OP’s progress has been very impressive. For those of you in biglaw saying you’re not up to OP’s level — can I ask how old you are/how long you stayed in biglaw? Why do you think you’re not there yet — was it huge student loans or something else? Because I would think that even without making partner, at OP’s age you’d be about an 8th year. 8 years in biglaw shouldn’t have you far from a million, right? Maybe 700 or 800k — since you started working 3 years later than OP did. What am I missing? Are you seriously saying an 8th year should have saved $100K for each year they worked? I mean, I suppose it’s not impossible, but that’s a stretch for all but the most frugal. Well it wouldn’t be 100k in SAVINGS, it’d be 100k in net worth — which you could get to by investing, no? Not sure why biglaw associates don’t invest a ton but they mostly don’t — it’s like either it goes to a 401k or gets held in cash. Index funds have an average of, what, 5% growth? It’s good, but it’s not going to turn $200k to $1M in 8 years. Also keep in mind that to really take advantage of compound interest, the money has to go in early and have time to grow. A first year Big Law associate makes just over $100k after taxes and has to live in one of the most expensive cities in the US and in many cases pay off sizable loans (which are often at 6-8% interest, so paying them off ASAP is a way better choice than saving/investing). You’re not going to have a lot of disposable income your first few years. Who told you an index fund averages 5%? Sure last year they were down 5%, but in 2017 they were up 19%, in 2016 11%; 2015 was a slow 1-2% year, but 2014 was a 10% year, 2013 was a 30% year. Average that together and in the last 6 years, you’re looking for an 11% return on average. You are beating the return in the market as compared to what you’re paying out in interest rates on student loans — the highest loans I heard off are 6-8% and many people depending on when they graduated are in the 2-4% range. Yet in my biglaw class EVERYONE was focused on throwing every $ into loans and then walked out of there in years 4-8 with minimal additional savings; they held onto none of their bonuses because they paid them out. I OTOH did was the poster above is asking about — double loan payments but an equal amount going into the S&P each month and yeah — in 8 years, you do get into the ranges suggested above. Lawyers aren’t math people AT ALL. Well when you play selective time period, the s&p also had a negative 37% return in 2008 and negative 22% in 2002 so if you were invested in that time period you would have done very poorly. The annualized average for the S&P for 20 year returns since recorded is less than 8%. Sure that’s higher than 5% but you can’t know if you’re investing at a good time or a bad time. So no it’s not a bad choice to pay down loans which you know will accrue interest over investing and hoping that you’re lucky and investing at a time where you’ll get a better rate of return. It’s not about being bad at math it’s having different risk tolerance levels. I’m the Anon at 2:40. Earning a million is nowhere near the same as saving a million – student loans and rent (and childcare for kids if you have them) are giant expenses that don’t add to your net worth. I started in Big Law at age 25, with a negative $50k net worth due to some law school student loans (partial scholarship, plus parents paid for undergrad – many first year lawyers have much more debt). My starting salary was $160k, my salary when I left was $210k. I lived in the SF Bay Area, so high taxes and VHCOL. I usually saved somewhere between $40-60k/year, which I think is pretty good, consider my take home pay was never more than $150k and was more like $100k in the beginning. I couldn’t afford to buy a home in the Bay Area (because I knew I wasn’t going to make partner or sustain this income), so the ~$30k+ year I spent on rent (for a 1 bedroom apartment) didn’t add to my net worth. In my four years in Big Law, I think I saved a total of around $220k, which was something like $160k after my loans + interest had been paid off (which I did quickly). So yes, I had some sizable savings, but very far from a million. Also keep in mind that Big Law generally offers no 401(k) matching. It would have changed my financial picture significantly if my firm was matching even 5% of my salary but they didn’t. I started biglaw with $250k in student loan debt. And to get the biglaw salary, I had to live in a HCOL area. I stayed in biglaw for about 8 years, paid off my student loans, purchased a house, and saved a ton. But I still left with only $500k net worth – a lot, but not nearly a $1M. IME, I was a lot more financially conservative than most associates – I lived in an unhip neighborhood when renting to save money, only purchased dinner out once or trice a week (although I did purchase lunch many days and eat out more often on the firm), didn’t take fancy vacations, etc. Most associates I know who left biglaw after 4-5 years managed to pay off their student loans, but didn’t save much on top of that. I was in biglaw 7 years, recently left for a small firm (~75% of biglaw salary). I am nowhere near OP’s level of net worth due to actually living in a HCOL (and formerly VHCOL) area, my husband and I combined starting with 250k in student loan debt, and substantial expenses for elder care and for a disabled sibling. I’d say our net worth is about 350k-400k now. I’m 40 and don’t have this much money. I’m confused by the $2100 monthly in the 401k comment? Isn’t the max for a 33 year old $19,000 in 2019? Divided by 12 months, that is $1583.33. I think it includes her IRA…max between 401(k) and IRA is $25,000. That makes sense and is probably the explanation, but that’s not the way it is written. I understand that Kat is constrained by the answers to the questions to a certain extent, but this post would have benefited from some higher level editing. I have $2100 in my budget spreadsheet, and just confirmed that it’s in my work allocations as such… but you’re correct, that’s over the limit! Big mistake. I’m not sure how this happened as I used to exactly hit the limit by the end of the year (maybe my last raise messed it up? ), but appreciate you pointing that out so I can update it now rather than running into trouble at year end. Oh this can happen easily! If your payroll input the deduction as a percentage of salary, as your salary increases that percentage is off. Most employers will stop you from going over. My husband has always had his as a percentage and hasn’t changed it through about 5 years of raises and promotions. Honesty, when he stops contributing in the fall, we enjoy the year end boost for holiday shopping and end of year charitable giving. And the sooner it goes in, the more it has time to earn interest! The problem is that if I don’t contribute every paycheck, my employer stops matching, so I need to make sure it stretches the full year. I’m not sure if this is unique to my firm, but you may want to double check! Thank you for sharing! This was inspiring. I would love to learn more about investing, specifically how to get started. Kat, thank you for this series! I don’t usually comment on posts, but I wanted to say to the OP: Great job! This is really inspiring stuff that takes alot of hard work, dedication and “staying the course”. 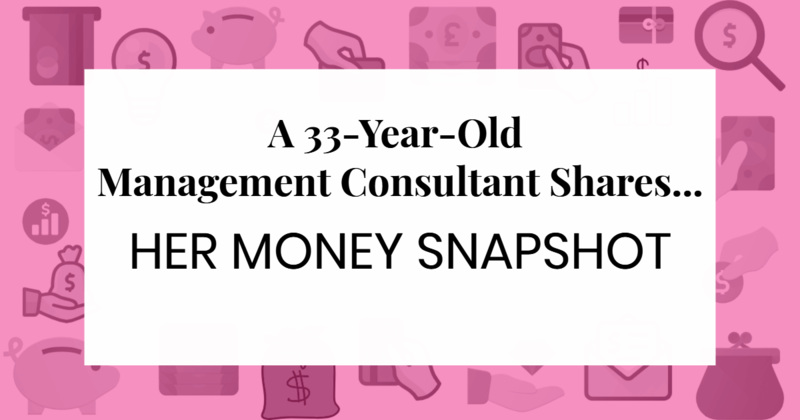 I am really inspired by her story and the results she is getting – particularly the vacation home at 33 along with the investment outside of retirement accounts, etc. I concur. Bravo! I’d love to hear more about your experience as a landlord. I too hate debt — to the point that I paid for my house in mostly cash. The thought of taking on another mortgage for rental income makes me feel uneasy. Shouldn’t I just pay off my current house more quickly? How many years of rental income would it take to equal the amount of money I’ll be paying on my current mortgage over the years? And if I have to take on a second mortgage to do it, combined with maintenance/hiring a handyman/anticipated tenant drama/depreciation, is a rental property worth it? OP, if you have any book/blog/article recommendations, I’d be grateful! Sounds like rental property isn’t for you! Nice job C! Thanks for sharing. It’s inspiring. I am curious as to where your rental and vacation properties are located at? Great job prioritizing savings! Just wanted to chime in and recommend you ditch your financial adviser – that 1% fee is really going to cut into your profits over the years. You CAN learn everything you need to know about investing, and usually index funds beat actively managed funds!